A little later than planned, but here is my pattern for a shark tail. 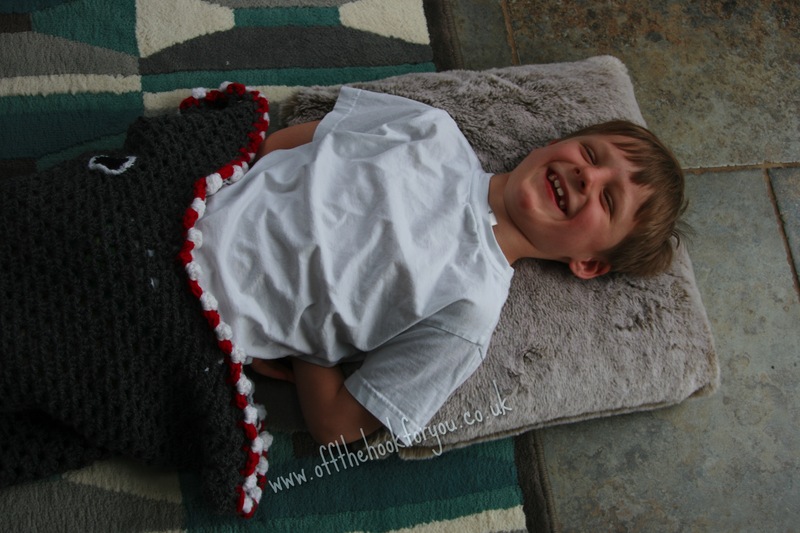 The shark was made when my son wanted a mermaid tail kind of thing like his sister had – but being a boy – didn’t actually want to be a mermaid (Mermaid tail pattern can be found here)! I hate sewing things together – so the body of the shark is made in a continuous round. There’s now a video made by myself, a 5 and 7 year old showing how to make the body! (UPDATE – 28th July 2015 – I’ve found out this video is very quiet on YouTube. It’s being uploaded at 400% volume currently – should be there is a couple of hours hopefully! – I’ll post a link when it is – or look on my Youtube channel). Finished items may be sold, but the pattern remains my property, I just ask that you give credit to me, Vicki Roberts at offthehookforyou.co.uk – and link this blog. Here we go – my first real attempt at a pattern (for someone else to follow rather than me and my scribbles) – so please let me know if things don’t make any sense…….. PDF link at the bottom of the page before the comments section. 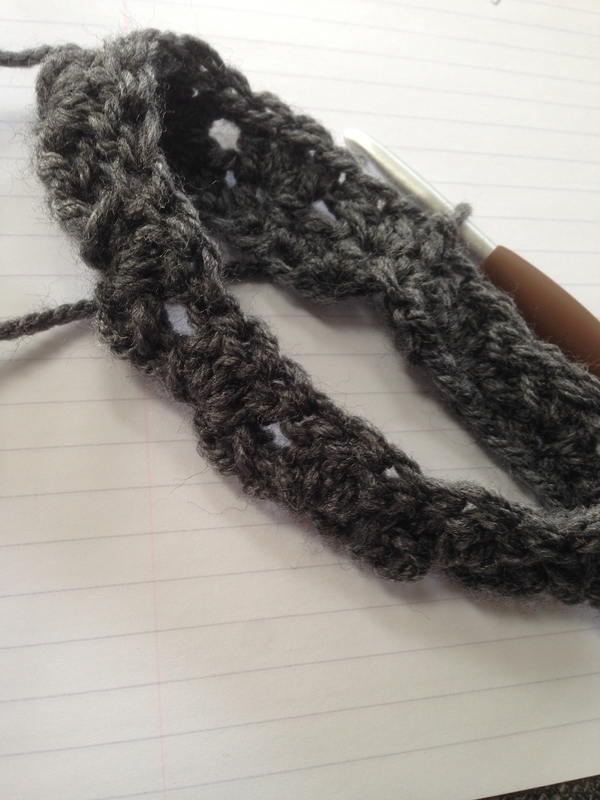 All terms are USA (Yep I know I’m English buy hey) FHDC = Foundation Half Double Crochet HDC = Half Double Crochet SC – Single Crochet SS = Slip Stitch Ch = chain DC = Double Crochet DC cluster = 3 DC in same space, or for the first one in a row, Ch3, 2DC in gap. 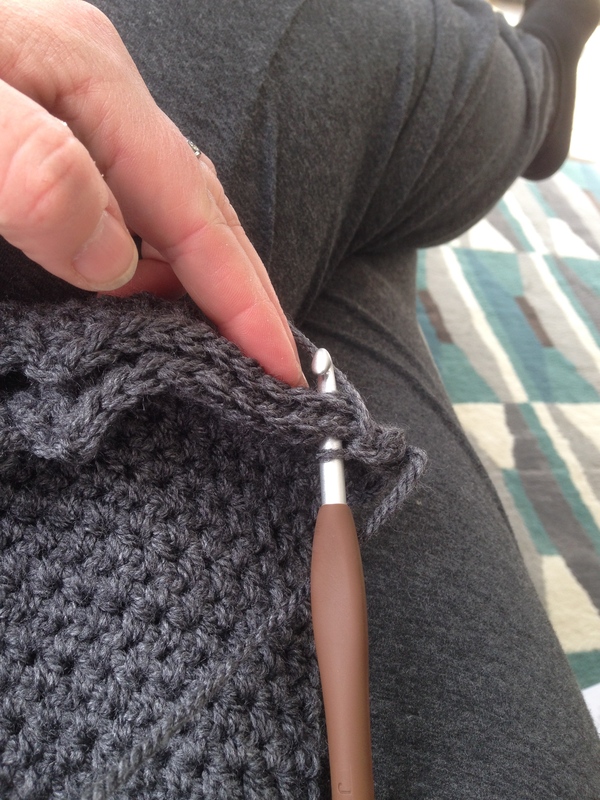 Bobble / puff Stitch – YO, Pull through, YO, go through 2 loops, YO, Pull through, YO go through 2 loops, – keep repeating until there are 4 loops on your hook (after the pull through 2 loops), then YO and pull through all 4 loops. I made this with Aran weight wool (Grey) – and for 7 year old it took about 450g or about 1100 yards. This same yarn I used. UPDATE – together with the little people we’ve made a video to show how to make the body bit of the shark. You can watch it here! Row 3- Ch3, 1DC, Ch1, 2DC over where you have SS. 1 DC cluster in the next 5 spaces. 2DC, Ch1, 2DC, 1 DC cluster in the next 5 spaces. SS over to top of ch3. Row 4- Ch3, 2DC in same gap (over the SS join). In the next gap (which should be the 2dc ch1 2dc)- do a 2dc, ch 1 2dc, 1 DC cluster in the next 6 spaces (which puts you over the 2dc ch1 2dc gap again) do a 2dc ch 1 2dc, followed by 1 DC cluster in the next 5 spaces, SS over. (Row 3 is basically repeated – but the number of DC clusters each side varies to ensure the 2dc ch1 2dc are all in the same place) Row 5- Ch3, 2DC in same gap (over the SS join). 1Dc cluster. In the next gap (which should be the 2dc ch1 2dc)- do a 2dc, ch 1 2dc, 1 DC cluster in the next 7 spaces (which puts you over the 2dc ch1 2dc gap again) do a 2dc ch 1 2dc, followed by 1 DC cluster in the next 5 spaces, SS over. Row 8 – Ch3, 2DC in same gap (over the SS join). 4Dc cluster. In the next gap (which should be the 2dc ch1 2dc)- do a 2dc, ch 1 2dc, 1 DC cluster in the next 10 spaces (which puts you over the 2dc ch1 2dc gap again) do a 2dc ch 1 2dc, followed by 1 DC cluster in the next 5 spaces, SS over. (Stop increasing here for a 3-4 year old – 31cm diameter). Row 9 – Ch3, 2DC in same gap (over the SS join). 5Dc cluster. In the next gap (which should be the 2dc ch1 2dc)- do a 2dc, ch 1 2dc, 1 DC cluster in the next 11 spaces (which puts you over the 2dc ch1 2dc gap again) do a 2dc ch 1 2dc, followed by 1 DC cluster in the next 5 spaces, SS over. (Stop increasing here for a 4-5 year old – 34cm diameter). Row 12 is repeated until you get to the desired length (height) of the shark before the mouth. for a 7-8 year old – this was 55 rows! Finish off. Lie the body flat so the 2dc ch 1 2dc are on either edge (This shows you where mouth should go). 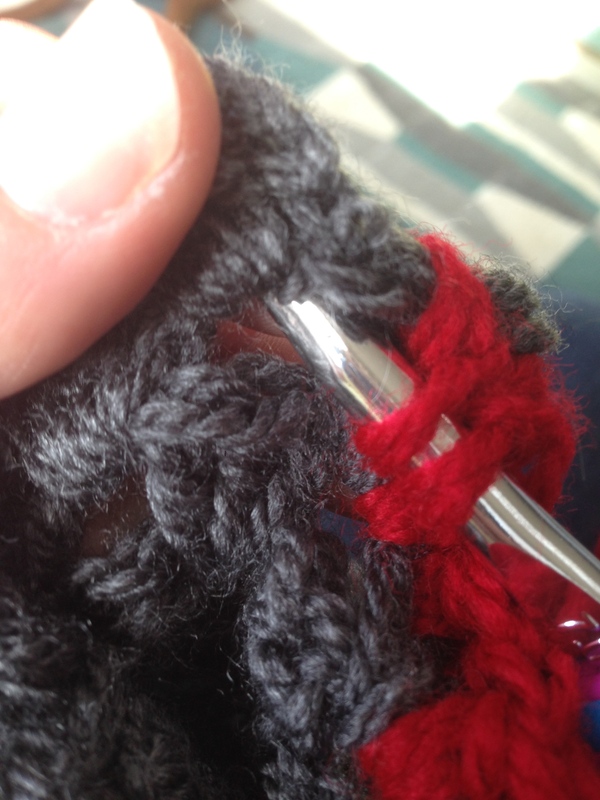 Find the middle cluster (vertical down the centre – mark with a stitch marker) and join your yarn. 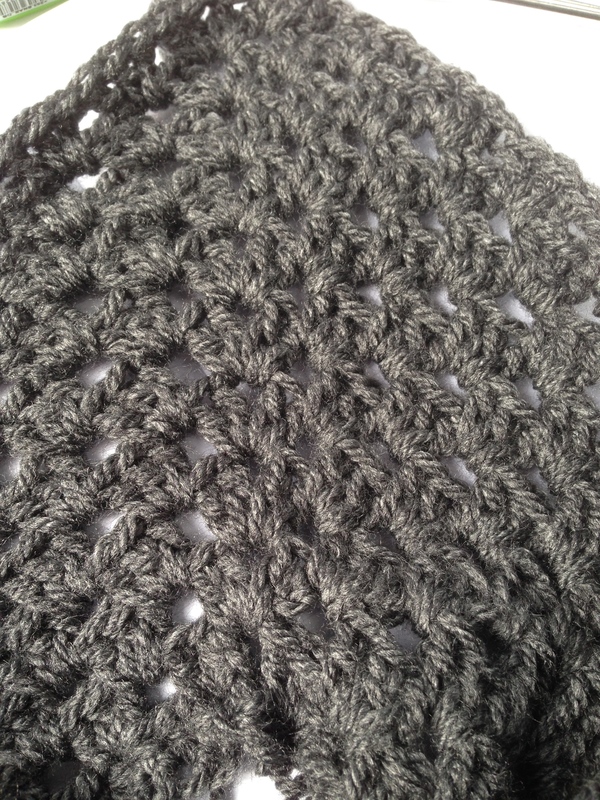 My pattern now only describes to 7-8 year old version – Just reduce by 2 stitches for each decrease in size). Row 1 – Ch 3 2dc in same space, 1 dc cluster in the next 15 gaps. Turn – ss over the top of the last DC Cluster. Row 2 – Ch 3 2dc in same space, 1 dc cluster in the next 14 gaps. Turn – ss over the top of the last DC Cluster. Row 3 – Ch 3 2dc in same space, 1 dc cluster in the next 13 gaps. Turn – ss over the top of the last DC Cluster. Keep reducing this way until you have 3 DC Clusters left. Fold these in half and SC along them to join together to produce a snout. Smaller jaw – Leave 2 DC cluster gaps either side of the larger jaw – and repeat as per the larger jaw. Finish off. Blood – 7.0mm hook Change to red – I didn’t have any aran weight yarn – so use 2 strands of double knitting. Go around the edges of the jaws and the gaps with HDC, about 3 HDC per cluster – but this really isn’t important. Finish off. With Black Magic ring, 8 SC in the ring, SS over 2SC in each stitch, SS over *2SC in 1 st stitch, the 1 SC* – repeat* to the beginning of the circle. Change to white, *2 HDC in 1 st, 1 HDC in next 2 stitches* to the beginning of the circle. Grey Aran weight yarn Row 1 – FHDC x 28, ch 2 Row 2 – 26 HDC, Ch 2 Row 3 – HDC all the way over, Ch 2. Row 4 – 23 HDC, HDC 2 tog at the end, Ch 2 Row 5 – 21 HDC, HDC 2 tog at the end, Ch 2 Repeat this until there are no stitches left! Shark Pattern Offthehookforyou – here is the link to a PDF version of the pattern – only 4 or 5 pages – hope this helps you all out (and we save some trees!). Thank you for sharing this fabulous pattern!! Love it! Can`t find a way to print this pattern without many pages. Would love to print off for later. Thanks. I’ve hopefully just added a PDF link – it’s only about 4 or 5 pages now. The link is at the bottom of the page before the comments. My niece saw this and just loves it any suggestions on how to scale down to make a baby cocoon ? Hi, I’m working on one now – leave it with me for a bit and I’ll what I come up with! Try using a thinner yarn. Eg. A baby yarn and a smaller hook. Hi, I’ve worked out the baby version using the same yarn,and hook size. Everything is just smaller. I’ll post the pattern soon, but it being the school holidays here my time in very limited! Hi, not yet! It’s written, but it might be published in a magazine. I should know I the next few days when I can release it! Any suggestion on how to make to make this foe a newborn? I must have missed the beginning chain part. But how many chains do I start with? How great is this! I am making this for my 5 year old son now. He didn’t want a mermaid one but a cool fish blanket. Thank you for sharing your pattern! Just found this on pintrest and have to say it is brilliant! I shared in my crochet groups and everyone is loving it. Can’t wait to try. I will post a picture when I do! Thanks Lola (can I be nosy and ask where you shared?). Glad you like it! I’d love to see a finished one when you’ve made it! I shared on crochet fanatic, crochet club, repeat crafter me and on my fb page. It is such a good idea lots of positive comments. So very cool. Sharing so my friends that crochet can see this. Thanks. BTW I am in Kansas. Love this pattern but can’t seem to be able to print it off, any suggestions. Thank you. For body R3: at the beginning it says -(which should be the 2dc ch1 2dc)- do a 2dc, ch 1 2dc,…. Does this mean that we are to ” (2 DC. CH 1. 2 DC) in Sp” ?? Hello, in the Chain 1 space between the 2 dc’s either side – do 2dc, ch1, 2dc. This is where your increase to get it wider happens. On every round in this chain one gap (each side of the circle) – is where you do 2dc’s, ch1, 2dc’s. Does this make it clearer? Hi. I love your pattern. I was just wondering is it done with one piece or two pieces of yarn held together? The actual body of the shark, fins and tail are made with Aran weight yarn – 1 strand. 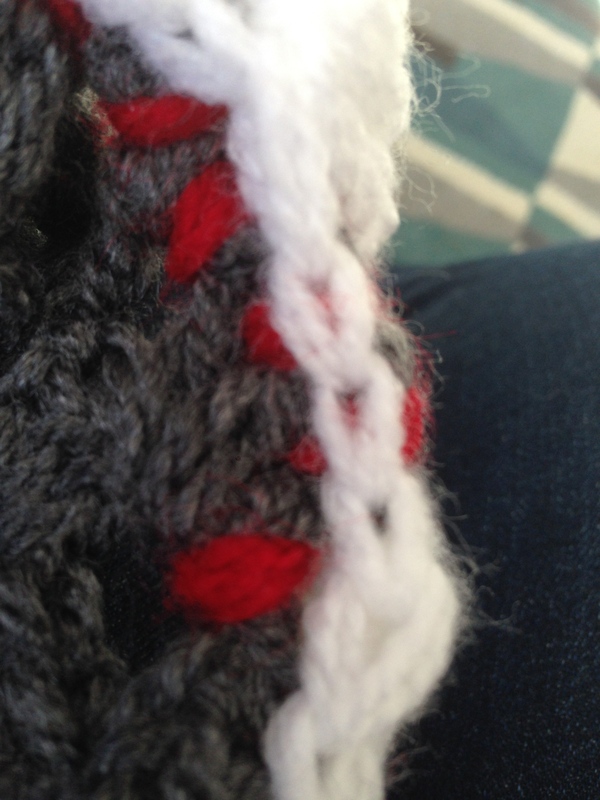 The teeth and the gums – I got lazy and didn’t want to go any buy any more yarn so I used 2 strands of double knitting in white and red! Hi, All it means – it that when you are down to the just having 3 DC clusters – in order to make the snout the correct shape. Just fold them inwards and sew together (So it’ll give you a right angle basically). The bottom jaw – is made the same as the top jaw -but you need to leave a gap of 2DC clusters when you start the smaller jaw from where the big jaw starts and finishes on the original round, (and then the same the other side 2 DC clusters). Hope that helps? Very cute. I’ve got someone interested on one for a very tall man. How quickly does this work up? I think it’s pretty quick. I did it on and off over about an hour a day in just over a week. It’s Aran weight yarn with a big hook to make to it quicker! 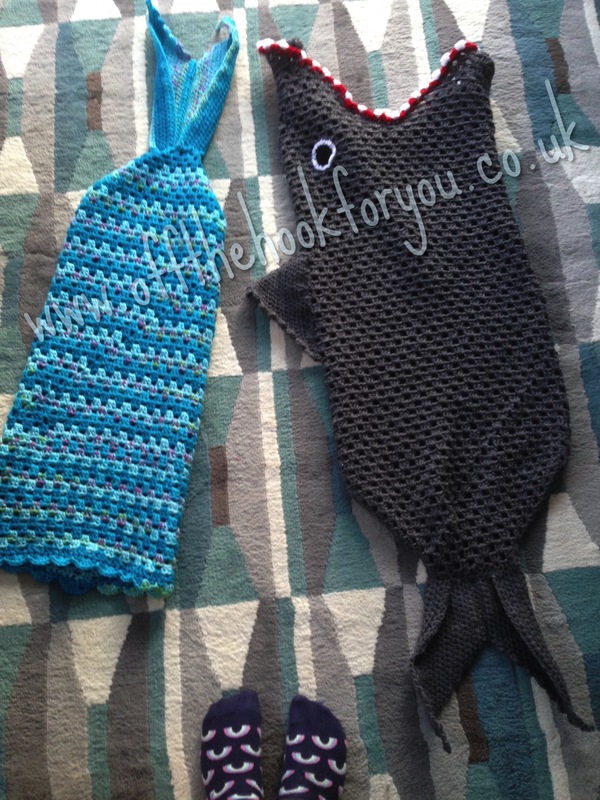 Do you have a pattern for the mermaid tail you made?? It’s written up in my shorthand, if you can give me a couple of days I’ll try and get it written up properly. We’ve been camp[ing with no phone signal anywhere (and then I dropped my phone in a dog water bowl…. so it doesn’t work at all). I did the mermaid one first, what size did you need so I can type that one up first – or at least tell you what to do! When I first saw the shark, I immediately thought it would be cool to make this as a mermaid, and my girls would love it! Thrilled that you’ve done this as a mermaid first. Yes, I would love to get the pattern too, for sizes 7 years and 9 years old. Thanks!! I am getting ready to go shopping for materials, and wanted to confirm the number of skeins and hook size needed. I think Aran weight is the same as worsted weight yarn-is that right? Thanks! I think so in regards to Aran weight vs worsted weight. I used one 200g, then probably 150g of the next. It does depend on what size you make though – this was for my 7 year old. Hook size -I started with a 6 I think for the fins. then went up to a 7 for the body so it was faster (I get bored easily!). The blog post does state what size hook etc, I’d love to see pictures when you’ve finished? Thanks for the information!!! I looked for the hook and yarn size but I must have missed it. I ended up with some really interesting yarn for the body, so hopefully it will turn out well. I have no idea when I will get finished (hopefully soon because I need to make two mermaid lapgans also! ), but I will post a photo when I am done. I am using Loops & Thread Phat yarn for the body. It is size 6, super bulky, 150g. Wow – sounds great – I can’t wait to see it! Okay, my friends are bugging me like crazy. Any tips for making this adult sized? Thank you for typing it all up. Hi, For adults – I’d start it exactly the same, but then just keep increasing for a few more rounds (maybe get another 16 clusters) – then just make it a lot longer. I think it depends on what size the adult is!!! It’s hard to judge as I’d need a smaller one than my husband! That’s exactly what I was about to ask. I’ve been asked to make one. I normally do only crochet toys, so this blanket will be an adventure for me. When I make my toys if I want it larger I use a bigger hook and 2 strands of yarn, I’m wondering if the same principle would work with this? Anyone have additional photos from different angles, or wearing it with the fin up toward the ceiling? Thanks! Hi! I just did a quick calculation for yardage and am a bit shocked by the #!!! My super bulky “phat” yarn is 57 yards a skein… So I need 20 skeins!?!?! Does that sound right?? Hi, UK Aran weight is about the same as USA worsted weight- so the yarn you have I think is far too thick for the pattern. THis is awesome!!! 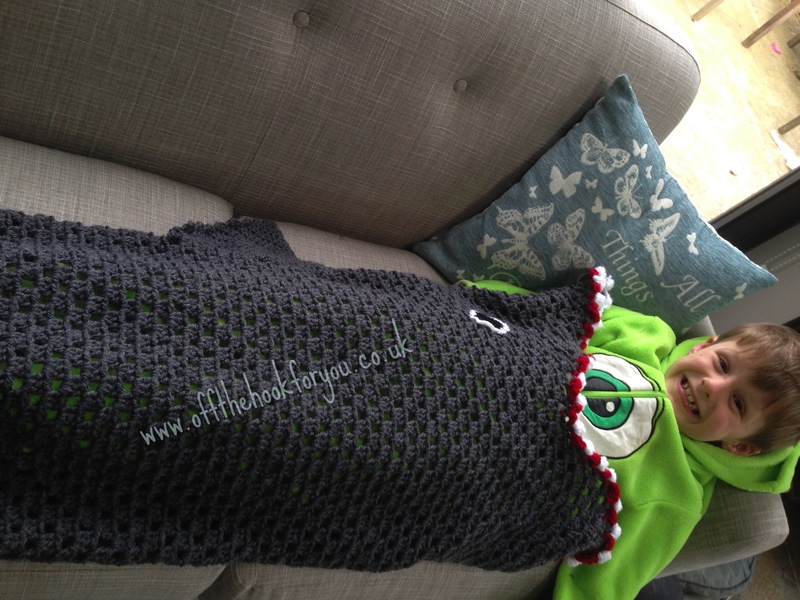 A free pattern for the shark blanket that is taking over facebook from Off the Hook for you !! Thank you Vicki Roberts for sharing your talent with us!! You are quite welcome. I’m sharing it on my blog, my business page and personal page. I am sorry you are being copied. Pattern piracy makes me ill. We are supposed to support each other, not steal from each other. Your pattern is amazing, and you are too kind to put out a pdf pattern. Keep up the great work, I can’t wait to see your next design!!! Any recommendations for uprising this for a size 2 daugher-in-law? She wants it for Halloween? I can’t tell if she could walk in it. Hi, So it’s sealed at the end….. but – if was to scale up for walking in and for an adult. I’d start with a bigger FDHC row – at least 50, if not more, then do the increasing as per my pattern, until it’d be the size of your daughters hips (is a size 2 a 6UK)? In which case – you’d probably be ok with stopping at the 7 year old size for increasing. Then make the tail fin as normal, but instead os stitching to both sides of the round, just sew on one side! Viola – Her legs should be able to fit through the hole at the bottom and she should be able to walk hopefully! I’d love to see a picture when you’ve made it! Great pattern!! I’m just stuck on round 3 of the body. When you say 2dc, ch1, 2dc, 3dc cluster in the next 5 spaces. Can you explain it just a little more. Are they all in one space? Or the 2,1,2 in one and the cluster in the next? I was able to open the pdf pattern in my iBooks. Thanks!! And thanks for clarifying where I got stuck!! No printer friendly version?? 18 pages, most only having a sentence or two is ridiculous as i need to make a few copies for friends. (that was using copy and paste, the ONLY way to print this pattern). I’m doing a PDF version now — hang in there! PDF file should be at the bottom of the page (before the comments) – please can you let me know if it works? Just curious, has anyone adapted this pattern for adults? I am interested in adult sizes for this pattern. I am by no means a crocheter but have means to get this made I just need larger dimensions. Thanks for any help. If you read in my comments – I’ve explained how I’d do it – basically keep increasing in the round more that round 12 – then keep getting longer until your adult size! Enjoy! I’m so excited to try this pattern. I have a four year old grandson obsessed with sharks right now. You know it was just shark week on cable! So I will be trying one for him and a matching one for his father! Thank you for the pattern! It is awesome!!!! Does the Ch 2 on the tail count as a stitch? I am getting stuck at Row 4. should we be losing stitche on both sides or just the one side. HI, You should end up with a a completely straight side which is the initial FHDC row, then only reduce on the other side to this- giving a zigzag effect. How many chains do I start with at the beginning? For the tail fins or the body? Tail fins are 28 FHDC(Foundation half double crochet) each. The body is 35 FHDC then joined to a loop. I’m excited to make some of these shark tails for nephews for Christmas! However, I’m in the US, and there is no 7mm crochet hook! I am figuring I need to use a size K (6.5mm), rather than an L (8.0mm), would that be correct? Will I need to adjust foundation chain size? I’m using Caron one pound worsted weight yarn. Each skein is 453.6g, approx 742 m/ 812 yd. I’ve got 2 skeins per tail. Figuring I’ll have extra. Thoughts? Thanks so much for making this pattern free! Hi, Glad you like my pattern! I used a 7mm hook to make it quicker! So I think you could use either hook depending on how holey you want it to (and how quick you want to make them as the 8mm would be quicker but would come out a bit bigger!). Do you have a PDF & Pic file for the mermaid? AWESOME! Can you tell me how many total rows each tail should be when you reach the final 12 stitches? I seem to not be losing 2 stitches every 2 rows. I.E row 3, you 2 ch and 25 hdc? Row 5, ch 2 and 24 hdc? Etc.. Are you able to post a photo of the side that is being reduced? Thanks! Hello! I am loving this pattern but on Row 12 (or the stop increasing row) – Ch3, 2DC in same gap (over the SS join).1 DC cluster in each gap, ss to join. Row 12 in just 3 DC’s in each gap all the way round (including the 2DC Ch1 2Dc gap). Do you have any plans on making a full video tutorial? Thank you so much. Hi. I stink at crochet. Is there any way to turn this into a knitting pattern? My niece just graduated high school, and my sister says she’d love this. i am confused with this am i suppose to ch3 1dc ch1 2dc in the ss space?? and also after i do the clusters in the next 5 spaces am i suppose to do the 2dc ch1 2dc all in the same space or do i do them in seperate spaces?? i hope you understand my question . Thank you so much for these patterns i’m hoping to have one of the shark and of the mermaid for Christmas presents this year. gap 1 : Ch3, 1 DC, cH1, 2DC. Gap 7 : 2DC, Ch1 2 DC. Hi! Thank you so much for taking the time to do this for us! I am really struggling with making the body. No links or links to videos show up on this page for me and the video would really really help me. Can you post that info in a comment? I have searched youtube and still can’t find it. Thank you for the pattern. My grandsons are going to love it. Hello & thank for the pattern. I was wondering if you planmake an adult version of this pattern? The 7-8 year old one has 16 DC Clusters for the top jaw. Just fold your shark body in half (with the increase sides in the middle of the body), and mark half way round. The for the bottom jaw -make sure you leave a gap of 1 DC Cluster between it and the op jaw. Hi! Love the pattern! Made the whole shark, but I’m stuck on the tail… I made the two, but they look too big… I have a long straight edge, and the foundation chain and the other side is at an angle (looks like a right angle triangle). Is this supposed to be the shape? It really just looks too big! I didn’t know if I misread the pattern… Thanks! I started “eaten by a shark” for my niece’s stepson. Started using Caron brand One Pound. 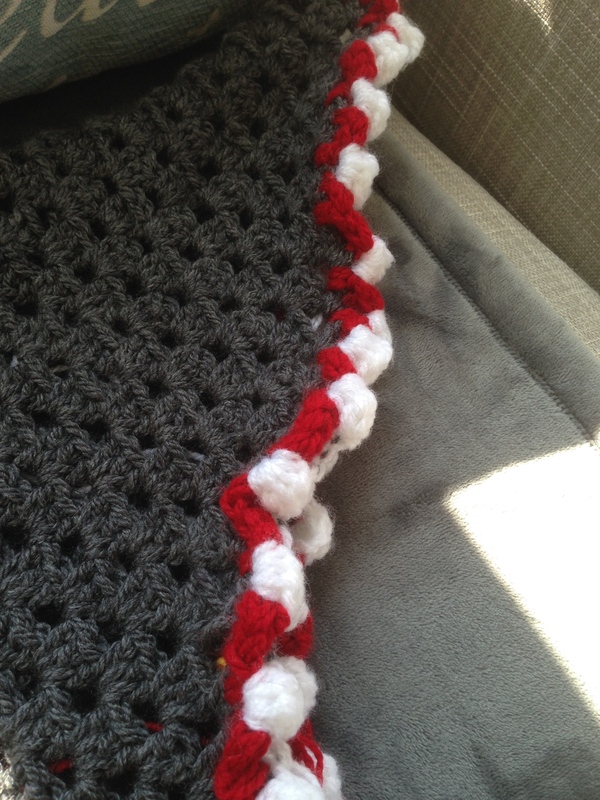 After working for about a dozen rows, the blanket seems rough to me, shouldn’t it be soft? Any thoughts or ideas? Should I just scrap this and get another kind of yarn? Hi, the yarn I used is pretty soft. Having spoken to another USA crocheter she seems to think Hobby Lobby – I love this yarn (Solids) is equivalent….. you’ll need 3 skeins. I have used this yarn. I would say it has more of a “wool-feel” so I wouldn’t say it is soft. Oddly enough, I was able to go to Hobby Lobby today, and purchased the brand you recommended (“I Love This Yarn”)… the difference is like night and day! Thank you! I am much happier with the result… Also thank you for your patience! Hi i am making your shark blanket and i having trouble with the lower jaw, when you repeat as per top does that mean decreasing until 3 Hdc are left and folding it in. I am also having troubles with the jaws.. Could you make a video from the beginning where we join the yarn? Hi, We filmed a video this morning, BUT I’m having problems with iMovie. I need to wait for the technical whizz to come home to fix it – hopefully in the next day or so – check my youtube channel! LOVE THIS SHARK PATTERN~ HAVING PROBLEMS PRINTING IT OUT ALSO…SOMEHOW I WILL GET IT….BEAUTIFUL WORK….VICKIE. im working on an adult size. Can you clarify for me? You said to add 16 clusters for adult size. Did you maybe mean to increase until row 16? I’d make it big enough to be a about 60cm wide (24 inches) when laid flat. It depends on how big your ‘adult’ is! So I’d increase beyond row 16 to get to this size. Love the pattern but I too had problems understanding the jaws section. Just a suggestion maybe Pictures would help to on that step. It’s not clear to me where I need to fold in half thanks again fir the pattern! It’s great! I just finished making this! The directions and videos were great! Thank you for sharing the pattern. Thank you for the pattern! Can you tell me the finished body length for the larger size? Hi, yes / Aran is the UK term / you can use any worsted weight / probably a heavier rather than light! Love the pattern and incredibly helpful videos! Is there a way to get the fin to stand up? Is there any pattern for side fins? I just returned from Scotland and I spoke with the proprietor of a yarn shop in Dumbarton as I thought I might be able to pick some up before I left. Sadly she didn’t have any and wasn’t able to tell me what the Aran weight really is. You said worsted weight which to my understanding is 4-ply. Then you said probably a heavier weight of rather than light. What did you mean? I need to make two of these for Christmas for my grandchildren. Would doubling the 4-ply worsted weight work of would this make it too heavy? This was suggested by the proprietor of the yarn shop. Thank you. In the UK we have 4ply which is thin, then double knitting, then we go up to Aran, chunky and super chunky. Where are you based? Having spoken to USA friends – I love this yarn from hobby lobby is thought to be the same- if a different country to this – let me know and I’ll see what other people have used. Does this help at all? There is a great conversion chart on the wool warehouse.co.uk – but internet is patchy where I am so I can’t post the link…… Try searching this site! Thank you so much for getting back to me and so promptly. I live in Florida and we do have a Hobby Lobby as well as Michael’s and Joann’s. What is the name of the yarn from Hobby Lobby? I’m just afraid that if I double the 4-ply it will be too heavy. Hi, Toni! The yarn called for is Wt 4. Think Red Heart Super Saver, or my fave, Caron Simply Soft. Hope this helps. I love this yarn by Hobby lobby I’m told gives the same effect too! I can’t wait a visit to the USA to stock up on yarn now…..
Picture shows 3 fins; one on each side and one on top of head. The top one looks different than the other two, but there’s only one fin listed in the directions. Can you clarify please? To Toni from Florida. I went to Michael’s and got their yarn”Craft Smart Value” Yarn. It works great and is inexpensive. I bought 3 skeins @ 364 yds each. The Shark is done all I need to work on now is the Fins and tail. I made mine for a 6-7 year old. hi can you please clarify round 6 of the body? Thank you! Yes you did 😊 it said my comments couldn’t go through so I tried again and looks like they both went through! Thank for replying I will try it tonight! Hello! Love the pattern…thank you! Question…when I’m joining to the top of the chain in a new round, I’m getting a diagonal line…any suggestions?? You will do – I just hid it underneath! Wow! What a quick response! Thank you! I was thinking of doing it as a continuous round (no joining)?? I’ve no idea how to do that? I know if you try and slip stitch over the next cluster it looks awful – hence I went this way to get up to the next level of a granny stripe. Let me know how you get on? Hi can you please clarify round 6 of the body? I am having trouble understanding parts of it. Row 6 is pretty much the same as row 5. You just need to DC cluster until you get to the Ch 1 gap of the (2dc ch1 2dc) of the previous round and do the INC here (the 2 DC Ch 1 2 Dc) in this Ch 1 gap. Does this help? I’m currently waiting for my tripod to come from Amazon – so a video will come in the next couple of days for the whole shark. I’m catching up with bits today – we were on holiday last week hence the late replies…… no Wifi and minimal phone signal! 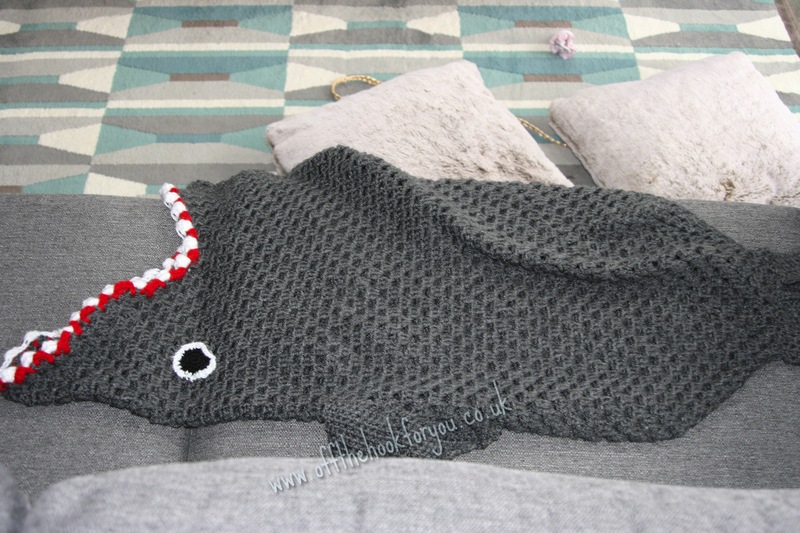 i really need to make a eaten by a shark project for my grandson, because i just completed knitting the mermaid for my granddaughter and I cannot find a kntiting pattern at all. Hi, Sorry – I’m not a knitter at all, if you’ve managed to do a mermaid knitting – the shark is pretty much the same apart from the jaws. Hi, I can’t believe I am saying this, but I can’t seems to get the tail right. Can you give me a stitch count? For example on row #3 where you say HDC back to the same place the previous row started….is that 26HDC? Thank you! Hi, Not a silly question – a few people have asked! I recorded a video for you tube last week – it’ll be posted his afternoon/ evening hopefully. There is a link to my you tube channel top right next to facebook, twitter and instagram. Thank you for the video!! It really helped understand the tail. Also, I had never done the FHDC, and I was not understanding how to count it the stitches. So your video helped me twice!! God Bless! can someone please call me regarding knitting a shark cacoon like for my grandson. my phone number is 650-773-4550. Not daft, I’d increase at least another 3 rows (maybe more), and the then just keep going pretty much until about waist height . The 55 rows were for my son who is 1m30cm. I’m sure I’ll get round to making an adult one soon! To make an adult Size would I only increase rows in the body of the shark? Or would I need to increase the size in the tail and fun also? I’d increase the body more to get it wider and increase the number of rows. I would make the tail bigger too and probably the fun after seeing how big the body but needs to be! It’s on my list to make -and write up – I just haven’t had time yet! just a close up picture of the fin would be great too! Thanks! Hi – No video as yet, but it will come when I get to that point on the current shark I’m making! Basically it’s pretty much the same as one side of the tail….. just keep reducing until you no stitches left! You need to line up the increase so it happens in the ch1 space. The 2dc clusters of row 6 will get you to that gap, and then so on with 3dc clusters for row 7 etc. jut make sure you are ss and doing the first cluster over the gap you’ve just made with the ss. 3 dc’s is one cluster, so 1 do cluster in each of the next 4 gaps. Hi, You can CH37, and do HDC (not DC) – and get the same effect. Your tail side won’t be as straight (the benefit of FHDC) – but it shouldn’t matter. Thank you, that’s made me smile lots! I was excited to see something for the boys in response to the mermaid. 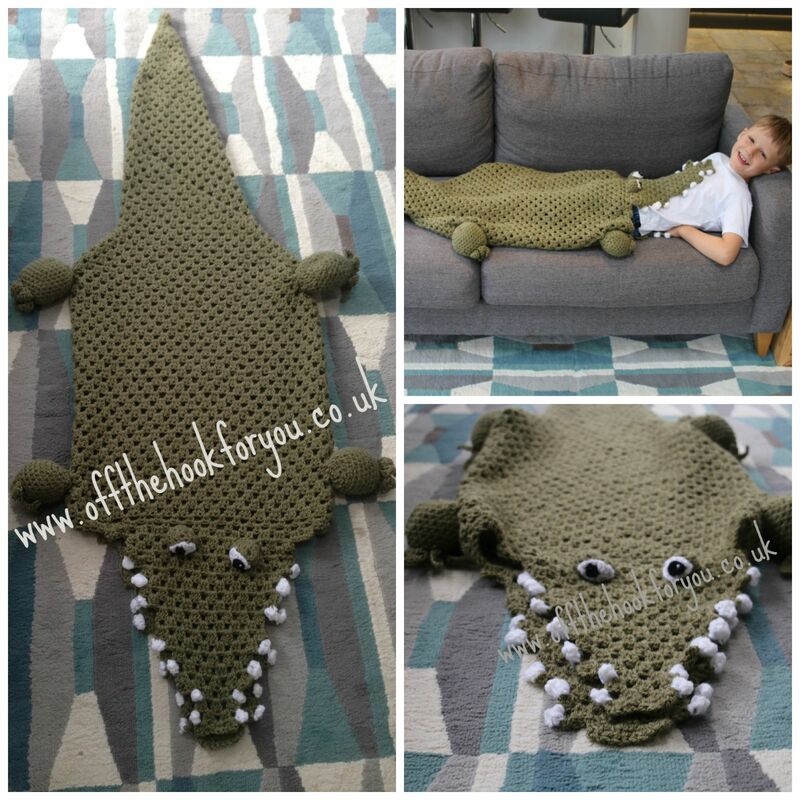 I am a knitter and would like to crochet the alligator. Have you created a tutorial/video for the alligator? It’s in the patterns link on the left hand side! Downloadable pdf for free! Merry Christmas! The pattern says for a size 7 to 8 year old at the start is row 12 it would be 39.5 cm. I am not metric but mine measures about 38 inches. Is this going to be way too big for a 7 year old? Wow – that’s huge! The diameter when measured flat is 39.5cm / so about 15 inches wide. Are you using Aran weight yarn and a size 7mm hook? I am using a size K hook, 6.5 mm, and a worsted weight yarn. At row 12 I have, I think, 32 DC clusters. Too many? Maybe I did the increases wrong? That sounds about right. Are you sure the diameter is 38inches??? That’s nearly 3ft wide? Yes. I have measured a few times. I am thinking maybe I am not measuring right? I did 35 FHDC to start, that measures about 30 CM, 12 inches diameter. That is the bottom where I attach the fin, correct? Then I did 11 rows of increases. The rest of the body needs to be kind of wide to get his body inside right? At 39 cm would a 7 year old body fit in? When I measure I lay my piece flat, measure between the sides where I did increases, then double this number to get the diameter. Am I measuring incorrectly? Best Christmas gifts ever! Thank you for the pattern and videos. The boys absolutely loved them! I think my older nephews were jealous. Glad I could help! Happy Christmas! I do not crochet or knit, but was looking for a sewing pattern for these sleeping bags. Do you know where I might find it? Thanks for any help you can give me. Hello, really fun pattern – thanks for sharing! I’m a little confused on the tail. I’ve watched the video and still can’t seem to get mine right. I start with 28 fhdc and decrease by two stitches every two rows, but by the time I get down to 12 stitches I have way too many rows! In your video, one half of the tail has 11 rows, including the fdhc row. 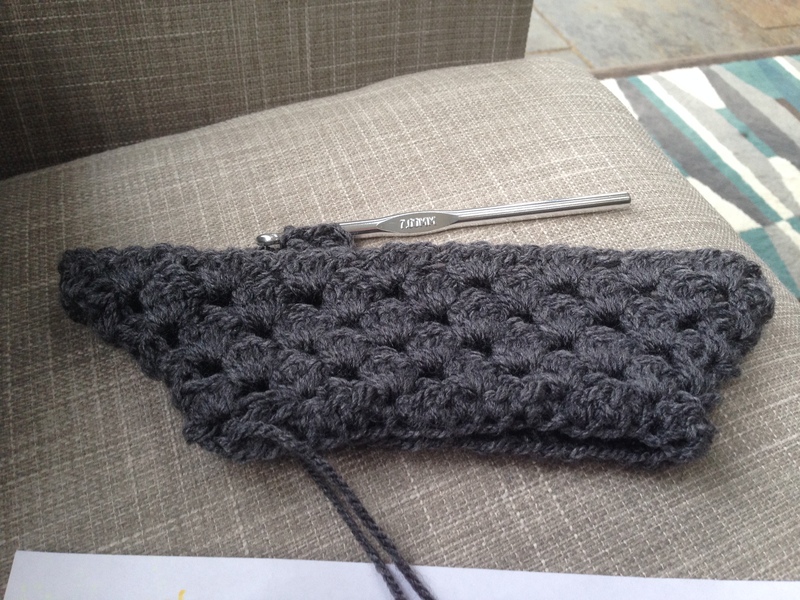 One half of my tail has 17 rows… any thoughts on what I’m doing wrong??? Thanks for the help, and so quickly! I made this in an adult size for my daughter-in-law, it turned out excellent! I adapted it a little – it is about 40 clusters around and 71 rows long. At row 63 instead of keeping it in the round I opened it up and continued the rows back and forth so it had an opening (easier to get in and out). I put a couple of buttons so it can be closed. I also changed the teeth so they would be more pointed (sc,triple crochet, sc). I can’t wait to give it to her. Thank you so much! Sounds great! I still haven’t had time take an adult one! I love this pattern. As I’m making in in the round, which side is the right side and which side is the wrong side? Does the shark ever have to be inverted? Thanks so much! This is such a cute pattern! Love to see something for Boys as well as girls too! My adult daughter wants one!! lol Good job and thank you! I love you, thank you for your beautiful lady to share with us, may god bless you! I read through all of the comments to make sure someone else hadn’t said it already. 1st, great work on the pattern. 2nd, I can get lazy at times and hate sewing pieces together. I didn’t feel like making 2 parts for the tail. I ended up just reversing the instructions when I finished the 1st half of the tail. Wow – what a cool idea! I know what you mean about hating to see pieces together….. me too! Hi Jean, Thank you so much for the comments! I glad you like the shark and the videos were helpful! I’d love to see a photo – you can email it to offthehookforyou@gmail.com and if I can share on my FB page even better! Did you sew the bottom together or did you leave it open for little feet to poke out off? I used a super soft twisted yarn so it is super cosy. Previous Post A bluebell wood anyone? Next Post Sharing the tulip love!